Curious about Malaysian women? Well, I’m going to show you the truth about dating Malaysian women in detail today. There are three major ethnic groups in Malaysia: Malays, Chinese and Indians. Women among these groups are very different: Malays and Indians only want to date men from the same ethnic group, but Chinese are happy to date other men. In Malaysia, Malays think they are better than Chinese and Indians. However, Chinese do much better than Malays in terms of being financially successful (this is also true in Indonesia where Chinese possess the majority of that country’s wealth). Also, Chinese girls in Malaysia are more open-minded and hardworking. Therefore, you’d better try Chinese girls in Malaysia first. Besides, if you pay attention to pop music in Asia, you’ll notice that the majority of successful Malaysian pop stars are actually Chinese, e.g. Michael Wong, Victor Wong and Fish Leong. In general, Malays rule the country, but Chinese’ career and financial success make others quite jealous. Japan – the only “Western” country in the east (when it comes to economy, it’s actually a Western developed country, but its location is in the Far East). Singapore, Taiwan, South Korea and Hong Kong – these four places were considered to be “the four Asian tigers” (they are rich and successful). Malaysia – it’s quite close to “the four Asian tigers” in terms of economy. Malaysia is actually more developed than most Asian countries, so women from Malaysia are not really looking at your money. Based on the above-mentioned analysis, you can see that Malaysia is doing okay, so please don’t assume that ladies in Malaysia like you because of your money. Her parents’ opinion is important. If you are dating a typical Malaysian Chinese, you’ll know that she is more liberal than the regular Malay and Indian. The only barrier that you may encounter is her parents’ opinion, because Chinese highly value family and their parents’ opinions (they truly trust their parents). Usually, Chinese tend to date Chinese, but it’s still quite likely for Chinese to date other races. Generally speaking, a Malaysian Chinese girl’s parents will decide you are cool if you can prove that: 1) you treat their daughter really well; 2) you are equally hardworking and successful. Malaysian Chinese girls speak fluent English. In Malaysia, almost everybody speaks at least two languages; therefore, the Malaysian Chinese girl you are going to meet is probably able to speak both Chinese and English very well (most of them speak Malay too). We all know that English is an incredibly hard language for Chinese people, but Malaysian Chinese speak the best English, compared with Chinese from other regions. As a result, you will have no difficulty communicating with her. 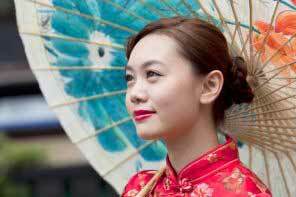 Malaysian Chinese women see themselves as Chinese. Although these women were born and brought up in Malaysia, they actually consider themselves as Chinese. Their parents have always told them that they are Chinese and should follow the Chinese tradition and culture forever. This is not about being stubborn; instead, this is a way to make children feel proud of who they are – Malaysian Chinese girls often do well at school because they believe they should do better since they are Chinese. That’s why when they grow up, they become successful in their career (what you truly believe in becomes true in the end). Therefore, you should respect her identity and culture. Malaysian Chinese people are probably more Chinese than those in China – Malaysian Chinese wear traditional Chinese clothes on Spring Festival and still follow the traditional Chinese rituals. However, most Chinese who live in China don’t really wear traditional Chinese clothes on Spring Festival anymore. Malaysian Chinese girls were mostly educated in English and in Chinese. Their parents expect them to read and write in Chinese, too. Malaysian Chinese girl will make you wait for a long time before she decides you are the right person. Although Malaysian Chinese women are already much more liberal than other ethnic groups in Malaysia, they still need lots of time to see if you are Mr. Right or not. Some Malaysian Chinese girls can make you wait for eight months before they invite you to their houses, so you just need to be patient and show you are sincere and genuine. Building trust is the prerequisite of dating Malaysian Chinese ladies. If you are invited to your Chinese Malaysian girlfriend’s house, it’s a big deal. Remember, Chinese Malaysian people value family a lot. Consequently, if she invites you to her house, that probably means you will meet her parents and other family members, and it’s really a big deal, because it’s all about marriage and family name. Having a boyfriend means a lot to them, so you should know it’s something serious. Be aware of lady boys, gold–diggers and prostitutes. They all look really hot and many of them live in big cities in Malaysia, so you should be careful. Actually, you can tell if she is a lady boy or not by talking to her – if her voice is male, you know she is a lady boy. You can give her a range of tests to see if she is a gold-digger with an agenda or not, e.g. if she never offers to pay on a date and always asks for gifts, probably she is a gold-digger. Do some research before going to a nightclub in Malaysia, for many bars and pubs are frequented by prostitutes. If you want to date a quality Malaysian woman, do more day game please.